The BJP, in response, dared Digvijaya Singh to prove his allegations and also tried to run down the former Madhya Pradesh Chief Minister's claims as irrelevant. Veteran Congress leader Digvijaya Singh Tuesday claimed the BJP had offered "Rs 100 crore" to a Congress MLA in Madhya Pradesh to topple the Kamal Nath government. The BJP, in response, dared Mr Singh to prove his allegations and also tried to run down the former Madhya Pradesh Chief Minister's claims as irrelevant. "BJP MLA Narayan Tripathi contacted Sabalgarh (Morena district) MLA Baijnath Kushwaha (of Congress) and took him to a dhaba (eatery), where former ministers Narottam Mishra and Vishwas Sarang (both from the BJP) met him (Kushwaha). They offered Rs 100 crore to Kushwah to topple the government. He was also offered ministerial post in the new BJP government," Mr Singh told reporters in the Madhya Pradesh assembly premises. He went on allege that the BJP, which was unseated in Madhya Pradesh after being in power since 2003, had made such offers to several Congress MLAs. "The BJP leaders told Kushwaha to come with them as a chartered plane was ready. But he refused to go with them," Mr Singh said. "Shivraj Singh Chouhan is dazed as he is unable to digest defeat," he added. Meanwhile BJP leaders, including those named by the Congress veteran, hit back. Mr Mishra said, "He has been making such allegations for a long time. This is merely a publicity stunt. 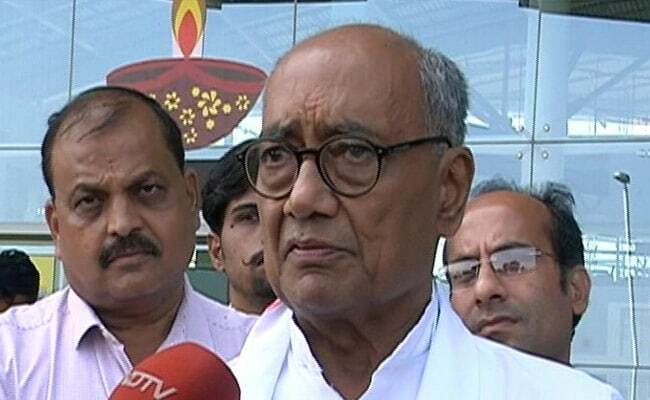 Digvijaya Singh should take legal action if he has proof." Leader of Opposition Gopal Bhargava dubbed Mr Singh a "gossip monger" and said, "You must have never heard about such a huge amount. Everybody knows that Digvijaya Singh is a gossip monger. He should not be taken seriously." "You know that the Atal Bihari Vajpayee government had fallen by a vote. The BJP doesn't believe in such practice (horse-trading)," Mr Bhargava added. BJP MLA Vishwas Sarang, also named by Digvijaya Singh in his allegations, dared the Congress leader to prove them. "He should prove in which dhaba this meeting took place. There is a Congress government (in MP) and it should take action. Digvijaya should show the video of the incident," Mr Sarang said. On the 10 per cent quota in jobs and education for economically backward sections of the general category, Mr Singh said the Congress was always in favour of such reservation. "The Congress is in favour of this reservation. But can this be done without constitutional amendments? Otherwise, this would prove to be a jumla (poll rhetoric)," he said. The Congress has 114 MLAs in the 230-member House apart from the support of seven other MLAs. The BJP has 109 MLAs.